The most important skill we need to develop for the 21st century is our ability to build strong partnerships. At the core of this is our relationships. Industry lines are blurring. We no longer know what industry Google, for example, is in. Does Netflix have a great distribution model or is it an award winning content creator? The organizations that are re-inventing themselves are the ones that are moving to the edges with purpose. They also know how to create streamlined two-way communication internally and externally. They value dialogue and understand that people are at the center of everything. The currency is trust, which leads to strong partnerships. A connected network knows no boundaries as it enables people internally and externally to connect around purpose and common needs and interests. It surpasses organizational hierarchies to connect people to each other and to ideas. In the 21st century, leaders moved from seeing a world of scarcity where they needed to compete to one of abundance where they can create new markets. Possibilities and opportunities are available to those who understand that the world is open and that social media is just a bunch of tools that help us reach people in more direct ways. They understand how to use video, for example, as a strategic tool to build thriving relationships and ultimately, partnerships anywhere in the world. These leaders know how to arm their business with the most valuable technologies to reach their goals. They never lead with technology. What is a connected network? Imagine that you were able to connect people around areas of interest and they were able to solve issues together. In most organizations, people know the people they work with and few have vast networks that span a large organization. Of course, smaller companies can innovate faster because they are nimble in terms of size and also they don’t have to reach consensus and fill a massive amount of templates to get work done. They can have conversations with the right people at the right time. But they, like large organizations, don’t always focus on how to streamline their work through robust internal and external connections. Too many organizations are using 20th century practices to run a 21st century organization and the cracks are starting to show. Hierarchies play a role, as organizations do need structure and processes, and at the same time, the world has opened up and can connect with anyone anywhere. I started my day with a quick chat with a musician in Nairobi and tried to help him with a challenging situation. The technology is there; the knowledge of how to make it work for you is the opportunity. 1) Connections: Enabling the right people at the right time to connect on specific issues. There are people who define themselves as connectors who know how to look inside their network and connect people at the right time. They often get out of the middle and let these connections build and continue to grow the network. Ask yourself how can connections leverage existing networks to grow your business? How do you build a trusted network and then grow it with people who can help you meet your goals. 2) Conversations: When the right people can connect over a specific need, they engage in a two-way conversation. The shift is from meetings to engaging conversations around understanding and addressing issues. In a connected network, people know who to bring into the conversation at the right time to drive it further. In a business, organizational silos no longer dictate who is invited into the conversation and the shift is to making sure the business issue is being addressed by the right connections. 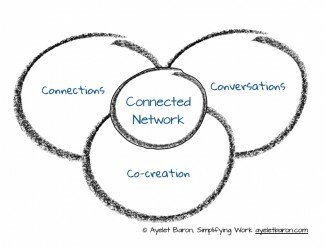 3) Co-creation: When the connected network brings the right connections to have the conversations to innovate and solve issues, co-creation takes place. This is why partnership becomes a critical edge for 21st century organizations as they recognize that through their connected network, they are able to drive business results and are not held back my antiquated 20th century management practices. Some times you will never know how deep your connected network runs as the growth of it depends on continually extending it. 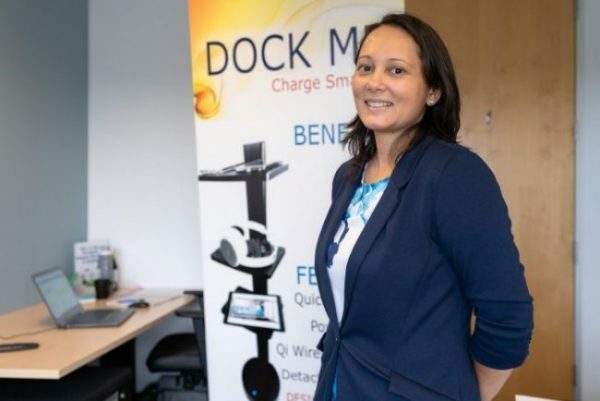 Imagine, if you were running a clinical trial and wanted to introduce a mobile Health solution and all the traditional channels tell you that you are non-compliant with the FDA regulations. Then imagine, if you could turn to your connected network and ask them to help you with this innovative approach and your network can help you have the right conversations with the right people. And finally, imagine, if you were able to co-create a solution that would help you experiment and save more lives. That’s a real problem I am working to help a client with now. One of the biggest challenges we have in our connected world is knowing who can help us in new ways and also having the courage to ask for help. A connected network allows you to break down barriers and bring innovation to save more lives through connections, conversations and co-creation.